A treasure trove of hearty laughs is yours when two of the funniest, most action-packed Muppet movies of all time make their Disney Blu-ray debut in a 2-Movie Collection. From the special star-studded lunacy in Muppet Treasure Island to the jewel-heist hilarity of The Great Muppet Caper, these two classic comedy-adventures are packed with mirth, mayhem and, of course, Kermit, Miss Piggy, Animal, Fozzie, Gonzo and all your Muppet favorites. Jim Henson’s whodunit heist-movie The Great Muppet Caper and the silly and swashbuckling high-seas adventure, Muppet Treasure Island, both restored and remastered, are loaded with unforgettable music and sparkling special effects. Two great movies plus a treasure trove of bonus features make the Collection the perfect holiday gift for Muppet fans and the entire family now available. 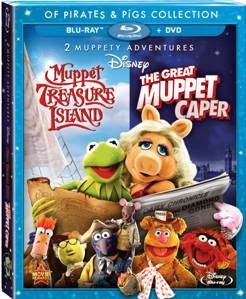 We are definitely huge fans of Kermit, Miss Piggy and the rest of the gang, so when we had the opportunity to review this double pack movie of both Muppet Treasure Island and The Great Muppet Caper I was pretty excited. The family and I sat down over the weekend and we watched both movies back to back. We were entertained from start to finish. I love watching characters that I fell in love with as a child with my kids. It definitely brings us closer together, especially when the hubby and I share our memories of these beloved characters with our kids. It definitely brings us all closer together. This is a perfect family gift to watch over the holidays. Definitely will bring you back to when you were kids watching The Muppets and will have your kids loving these hilarious characters as well. Disclosure: All opinions are my own. I received Muppet Treasure Island & The Great Muppet Caper at no cost for the purpose of this review. No other compensation was received.